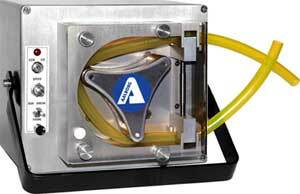 Peristaltic pump designed to move liquids of low to high viscosity from source to destination at user-set speeds from 50 to 350 RPM. The easily accessible controls provide for Priming, dynamic Braking, setting RPM, and Reversing Flow direction. There is also a Power LED. The DP model has the added benefit of a programmable timer. The TPVRP timer relay can be set to dispense liquid over a chosen time period, and to stop dispensing for another chosen time period. Seven time periods are possible: 0.1 – 1 sec., 1 – 10 sec., 6 – 60 sec., 1 – 10 min., 6 – 60 min., 1 – 10 hr., or 10 – 100 hr.